Captivating on the skills of our professionals, we are involved in offering best quality of Skidproof Polyurethane Wheels. These Skidproof Polyurethane Wheels are extensively used for polyurethane covering of various, in hospitals and super markets and are very reliable also. Our products are easy to use. One can avail a wide assortment of Skidproof Wheels with PP Core Double Ball Bearing from us in bulk. The offered Skidproof Wheels with PP Core Double Ball Bearing is known for its smooth performance in suitable applications. 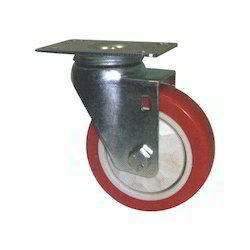 Skidproof Wheels with PP Core Double Ball Bearing is widely used in the industries where heavy weight is carried. 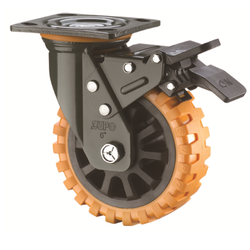 We offer a comprehensive range of Heavy Duty Skidproof Caster Wheels With Durable Ball Bearing to our clients across the nation. Designed in compliance with the international quality standards, these moldings are largely appreciated for their dimensional accuracy. We accomplish the bulk requirement and in order to achieve this objective, these moldings are tested on various quality parameters. We offer them at most competitive prices. Keeping in mind the various requirements of the customers, we are involved in manufacturing and supplying best quality of Skidproof Double Ball Bearing Wheels. 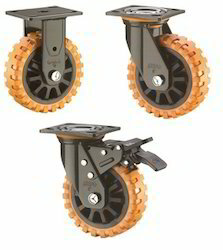 These Skidproof Double Ball Bearing Wheels are extensively used in skate board and in various other industries. These products are easy to use. 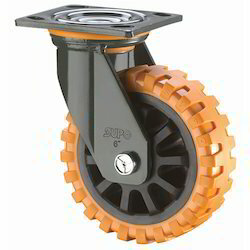 Looking for Skidproof Polyurethane Wheels ?